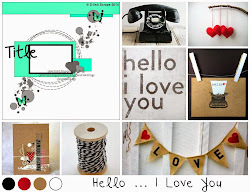 To be honest I've spent hours this afternoon fiddling around with my blog trying to figure something out and thanks to the help of the lovely Lisa Warren I think I've accomplished what I started out doing. In the past few months I've spent quite a lot of time refurbishing and upcycling. Not only furniture...but whatever I can get my hands on. I've already shown a few projects but didn't really go into how they were done. I've had quite a few emails about these projects so I thought why not share how I've refurbished/upcycled them? Most of them are easy peasy and really do make a difference...even if it's just a coat of paint. So...the first few refurbishing and upcycling posts will be things I've already shared so I apologise for you having to go over them however this time I'll be sharing how I made them. So you never know...you might just learn a thing or two to tackle on your next home project. I'm sure you'll be happy to know that most of these projects are made with a strict budget in mind. The first thing I'm going to share with you is the Shabby Chic dining chair I refurbished. Here is a Before and After shot followed by a list of what you'll need. STEP 1: I started by giving the chair a good clean then a light sand. As it was quite old it didn't have much lacquer left on it anyway. I then gave it a light coat of white paint. (The paint I used was a huge tin my husband had given to him last year so no cost there). After the first coat dried I gave it another light sand then another coat of paint and let that dry again. OK...so now we have a nicely painted chair and of course you could finish right here ...but where would the fun be in that? STEP 2: Once I had my two coats of paint on I attacked the chair with my sandpaper. TIP: Be sure not to over distress the seat or back of the chair where the doilies will be stencilled on later. Once you're happy with you're distressing and you think the chair has had enough set your sandpaper aside for a while. STEP 3: Grab your large paper doily and your adhesive and let's get on to the next step. Position your large paper doily on the seat of the chair so it's sits nicely in the middle. Once you're happy with the placement of the doily attach it to the chair with your adhesive. With your pink paint and foam brush lightly paint over the doily CAREFULLY so as not to rip it. TIP: Use less rather than more paint for this step and build up colour as you go. Too much paint will make the fragile paper doily to wet resulting in unwanted tears and rips. Once you have finished set your chair aside until your stencilling paint is dry. STEP 4: Dry? Now we are ready to CAREFULLY remove the paper doily from the chair. 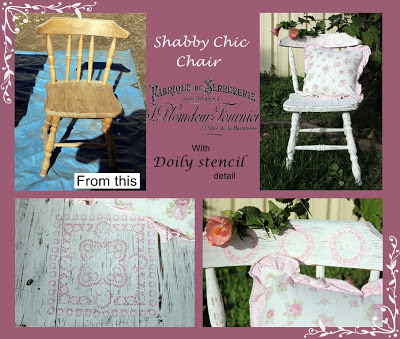 REMEMBER that the chair might be dry but the paper doily may still have globs of wet paint on it so be careful at this step. TIP: Depending on what sort of adhesive you've used some of the paper doily may stick to the chair. Don't panic! Just remove what you can in large pieces then go back over it until you've got it all off. If there is any residue from the paper doily simply sand it very lightly with the sandpaper and you'll find it comes off quite easily. STEP 5: Now you'll need to grab your 3 smaller paper doilies and following the above steps position them on the back of the chair ensuring the middle one is centre. Again, once you're happy with your placement adhere them and paint over them with the pink paint and foam brush. TIP: Keep in mind the smaller doilies will be a little more finicky to paint over so be sure not to load your brush too much. Once dry remember the steps above and remove your paper doilies. Sand around and inside your stencilled circles as much or as little as you like. Add a pretty cushion, grab a cuppa and a good book and sit under a tree and relax after all your hard work. This is easily a one day project. Until next post...stay safe and don't forget to look for bargains! WOw! Gorgeous! We are so on the same wave length, I'm looking for stuff right and left to refurbish lately. I'm new at it though so its not blog worthy stuff yet! 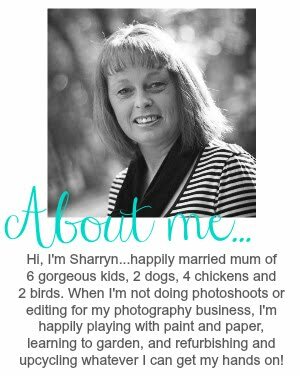 Awwww, Sharryn, this is beautiful, thank you so much for sharing this. Inspires me to go and hunt out my great aunts wooden chair from our shed and get cracking on it.